PORT MORESBY – The Philippines is ready to build schools and deploy teachers to Papua New Guinea in a bid to enhance the development of its neighbor. On the first day of his visit here, President Duterte has announced the government’s education aid to Papua New Guinea in appreciation to its generosity and kindness to Filipino workers. 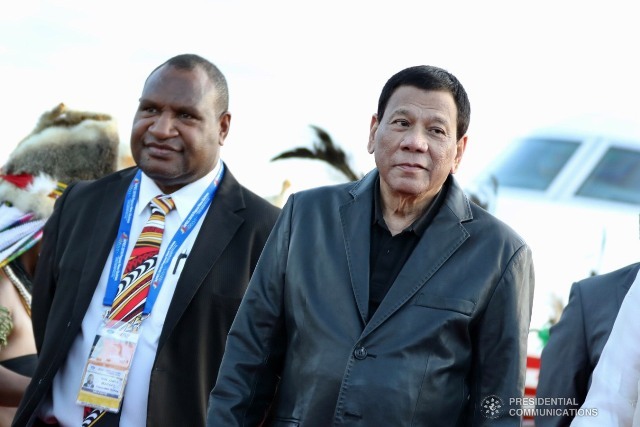 The Philippine leader intends to relay the offer when he meets with Papua New Guinea Prime Minister Peter O’Neill during the regional summit this weekend. Duterte is in Ports Moresby for the Asia Pacific Economic Cooperation summit but will cut short his three-day trip by a day to return home Sunday morning. “We need to develop and develop well Papua New Guinea. We are willing to help establish schools. We will send vocational skills training, TESDA (Technical Education and Skills Development Authority), ” Duterte said during the meeting with the Filipino community Friday night. “I heard that most of our countrymen are treated well and respect. In return, I’ll see him (O’Neill) tomorrow (Saturday) but we are ready to build schools, ask teachers to come here and help in the education of your people,” he added. Duterte said the government was also prepared to help Papua New Guinea with its livelihood projects to improve the welfare of its people. He took pride that the Filipino workers are “industrious” and “bright,” adding that Papua New Guinea could take advantage of their expertise. “We can come here, we can establish schools, if you want universities and we are good at that. We will try to help you,” he said. Duterte said he was grateful to Papua New Guinea for its fair treatment of Filipinos. “Papua New Guinea has been very kind to us,” he added. He reminded Filipino workers to “love” Papua New Guinea and be grateful for its kindness. The President, meantime, cautioned Papua New Guinea against allowing multinational companies from “encroaching” its farmlands. He said they should guard against such activity, citing that the Philippines no longer have farmlands for food crops. “It’s overtaken by multinationals. Be careful about that. You may but do not allow encroachment of multinationals because at the end of the day what you would get is the salary of the people but the bulk of the money goes to the company,” he said. “Do not allow big money to enter. You take time to develop,” he added.